Well, I haven't moved yet, but since I was making a little bit of fun of the idea that peoples' ashes need to be respected, it seems appropriate that my bike ride today landed me in the cemetery. New digs indeed! I wasn't sure that bikes were allowed, but that worry evaporated the first time someone whizzed by. Lots of folks were moving in today, and there were a lot of fresh openings. Some really beautiful mausoleums, lots with recognizable local names; a few like advertisements for the prominent businesses named after them. The coolest sculpture I saw was of leather-looking couches made of granite. They looked really comfortable, but I'll bet they give new meaning to the notion of chillin'. I knew I would and eventually did find my grandparents' grave, and that of my uncle nearby. It had to be within sight of Red Jacket, where Granddaddy wanted to be buried. (I imagine he mentioned it once, and it somehow became his most ardent wish for death). All in all a nice wind-y ride. Along the way, I toured the living mausoleums to days gone by. We have some really really fine mansions in this town, most still available for less than a small house elsewhere. One of the finest is occupied now by this alleged coke dealer and pimp who came here from Las Vegas. I used to have the blueprints for that one in my office, since it was supposed to house the school I once headed, but I think the founder pissed off the family and so it went to the preppy Proddy school, which sold it to, you know, the pornographer dude. There goes the neighborhood. Of course, I couldn't resist going by the old school; gazing into what had been my office reverted back to a mansion now. Overall, the most powerful feeling I had was to hope that there wouldn't be some former students driving by to make me look as though I were part of the past too, patrolling the place like some kind of ghost. These students are remarkably attached to the place. I guess I'm ready to check out, though. You know, I was really really angered by the governor of Arizona, giving her self-righteous spiel about how the Federal government hasn't done anything about the "illegals" living among them. As though this is the fault of the new administration she wants to tweak. As though there would be any way to establish "suspicion" of being illegal other than by profiling. Um, hello, that's what suspicion means. What the hell could seeming alien mean other from acting "different???" But she gets up a head of righteous indignation and lots of folks will follow her, feeling invaded somehow, as if these border crossers weren't also leaving something behind. As if they really want to leave strong and deep connections with people, traditions, land, the burial grounds. But when there's no economy, what are you going to do? I know Buffalo is holding out better than lots of places, but I'm not sure there's a whole lot of what gets called innovation here. We talk a good game, but mostly things are run by the folks who've always run them, and they're holding on tighter and tighter the less there is to go around. And, um, I would never want to be a member of a club that would have me anyhow. There's always some hidden codicil to the arrangement. A spot in some mausoleum. Spooky. 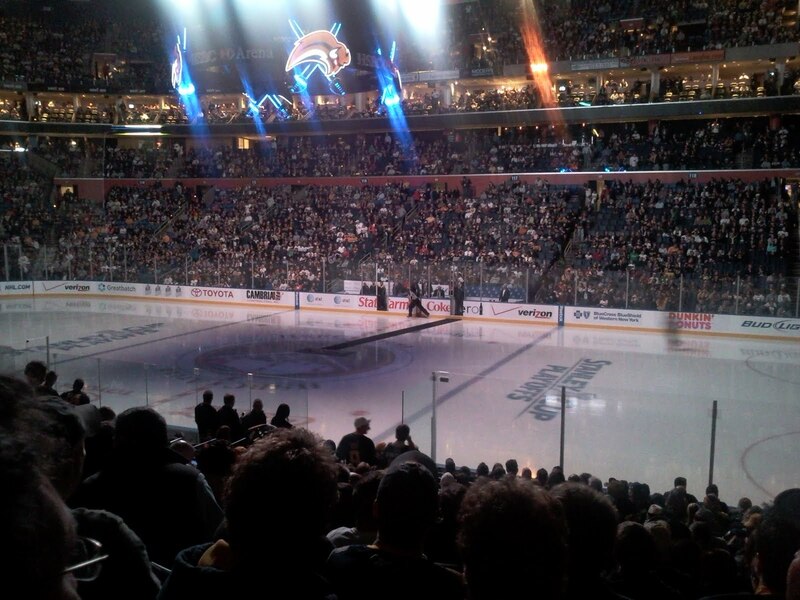 Hey, I went to the Sabres game last night. It was a pretty big deal, although I feel toward all the hype the way lots of people must feel about ghosts. I mean, I'm into it and everything, and I did the screaming jumping out of my seat high five thing. But I felt askance, as though way too much was being made of what is really just a game. I especially felt this when the crowd roared for the shaking booty up on the big screen when the booty was right down in front of me and wouldn't have been shaking but for the screen. Can't you just see where the megatron in the middle will someday soon become a hologram, with 3-D seeming figures. Maybe you'll be able to watch from inside the action, with all the music and cheering seeming just for you. Don't get me wrong, it was fun. Just not all that fun compared to other possibilities I can imagine. Especially considering the cost these days. And they screen you on the way in as though it could be as dangerous inside as, say, riding a bike on the streets is. Just a little creepy for the scale of the simulated mayhem. Then there was this big glove throwing fight at the very end, tweaking the rules requiring that its instigator be suspended when the fight is in the last seconds. But it gave the crowd it's punctuation thrill. 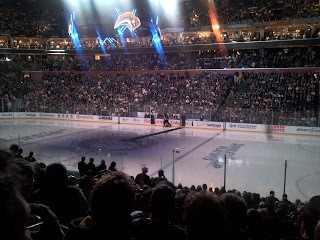 We went screaming into the streets, "Let's go Buffalo!!!" against a rhythm played on hundreds of car horns. I'm not saying all these hyper-innovations are bad. I try to implicate myself with everything I say. I do have elaborate ways to say goodbye though, and that's for sure. Well, moving on then. The car heat's back, the boat is gone, the belongings winnowed way down. Spring has sprung. You know the drill. Don't cry for me, I'm still on this side of all those ashes. The thought I had was that the arena where the hockey playoff game was played was itself in fact a hologram, or microcosm if you will. The feedback loops for hormonal interactions were compressed, pretty much in the way that the radioactive materials are brought into proximity so that they can "go critical" and create heat or a bomb in a nuclear reaction. I think that's what the marvels of information technologies is doing for the planet, really. It would be nice if we could cheer together without having to mark someone as the enemy. It would be nice if there didn't seem always to be the requirement for someone to hate, someone to be angry with, someone to act as scapegoat for what frustrates us. It would be nice if we weren't holding on quite so tightly so something which indeed was once really really nice, but now it's time to move on. Move on in the direction of humanity, decency, bigger hearts and minds. Move beyond endless graveyards and meaningless ritual toward something more alive. Where people who once were loved live on in fact, through words or even pictures or videos that they participated in. These are the only meanings which really cross the boundaries of space and time. Eternity is meaning meant not symbols preserved. Well, if you were to ask me, which I know you're not, but that's what I'd say if you were to.